An Old World species, occasionally grown, especially as the red-flowered cultivar ‘Rosea’ and apparently very locally escaped into fields and roadsides. First collected in 1941 in Kalamazoo Co. Double-flowered forms attributed to C. laevigata are C. ×media Bechst., a hybrid with C. monogyna. Quite similar to C. monogyna vegetatively, but the leaf lobes and stipules tend to be more abundantly toothed. 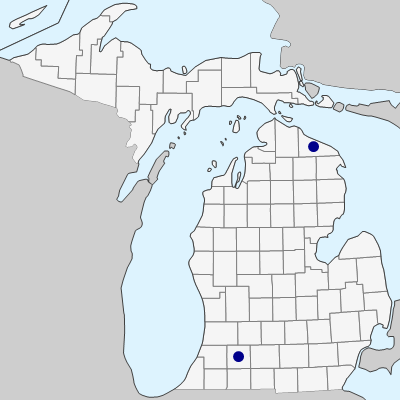 The specimen mapped from Lenawee Co. in Michigan Flora has been annotated as a possible hybrid of C. monogyna and C. margaretta by J. B. Phipps. MICHIGAN FLORA ONLINE. A. A. Reznicek, E. G. Voss, & B. S. Walters. February 2011. University of Michigan. Web. April 20, 2019. https://michiganflora.net/species.aspx?id=2458.